This summer flan not only looks irresistible and tastes great, but is a doddle to make using a ready-rolled sheet of puff pastry. Preheat the oven to 220°C/200°C Fan/Gas 7. Place the peppers and garlic in a shallow roasting tin and drizzle over half the olive oil. Roast in the preheated oven for 10-12 minutes until just tender. Unroll the pastry sheet onto a large baking sheet lined with baking paper. To make working with your pastry easier, remove the packet of pastry from the fridge about 20 minutes before unrolling to allow it to soften a little. 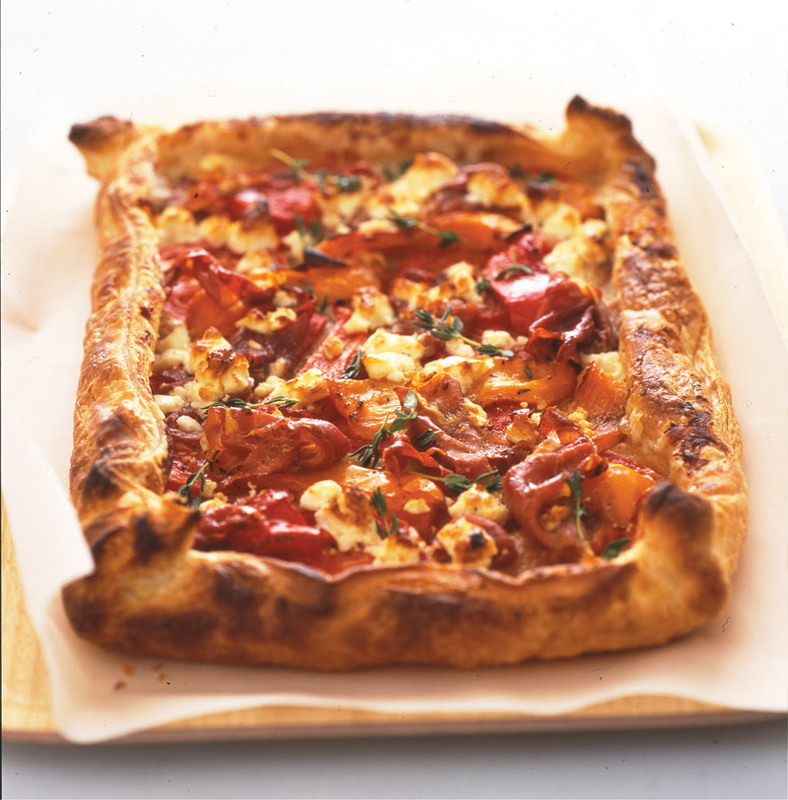 Arrange the tomatoes over the pastry, leaving a 2cm border, and scatter over the thyme leaves. Top with the crumbled feta and ruffles of Parma ham. Season with freshly ground black pepper. Drizzle over the rest of the olive oil. Gently fold in the pastry edges a little to give a raised border. Brush the pastry border with beaten egg. Bake the flan for 15-20 minutes until the pastry is crisp and golden and the peppers are lightly charred in places. Serve warm or cold with a peppery watercress and rocket salad and some boiled new potatoes for a lovely late summer lunch or supper. Mix it up: You can use any other variety of continental ham for this flan, or try thin slices of salami or pastrami instead.